Keystone lands the 2013 OnTheSnow Visitors' Choice Award for Best Park & Pipe in the Rockies. 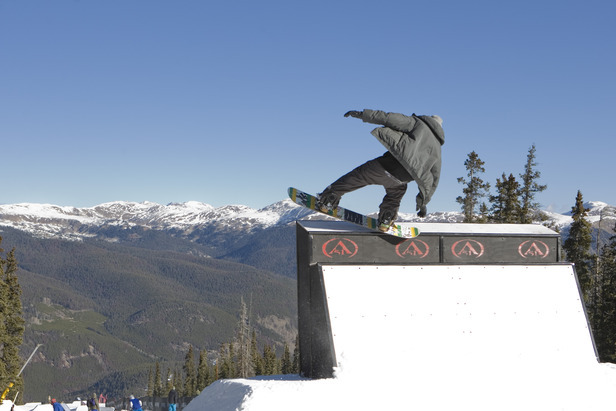 Just 90 minutes from Denver, the A51 Terrain Park in Keystone, Colorado is ranked as one of the best in the country year after year. The park is now three times its original size, thanks to a huge recent investment, and it has its own chair lift, keeping freeriders right in the heart of the action. It’s also open late during night ski evenings, in fact it's the largest park in Colorado to be lit at night. Last winter, Keystone celebrated the A51 10-Year Annivesary Showcase, which featured the "boxzilla”—more than 10 boxes stacked continuously to form a challenging line for skiers and riders to come out and test their skills on. The action was accompanied by music, an MC and swag giveaways. LEARNING/PROGRESSION PARKS: Beginners can master the basics in the Incubator, before attempting tricks at A51. ADVANCED TO EXPERT PARKS & PIPES: The A51 Terrain Park has more than 100 features: jibs, rails, boxes, ramps, kickers and walls. highlights include the 400-foot superpipe, with walls climbing to 15 feet in some places, a 50-foot flat bar and a snow bowl.